Adam Randall spends his days toiling away above our heads building something we take for granted – and would be damned without. He’s a roofer. He literally puts a roof over people’s heads. It’s easy to grant him a small sense of nobility, as he works to ensure our peace of mind. But this time last year, Randall’s motivations were far from noble. Drinking led to drug use. It all came down on his head in the end. In May, he was charged with breaking into a gas station and will appear in court next month. Randall, who lives in Dartmouth, doesn’t shy away from what he did. He doesn’t even break eye-contact as he recalls the previous year. With his addictions at arm’s length, he’s now looking to lend a hand to those he know he can help. And with close to 10 years experience roofing, it’s the one thing he knows best. Randall has started a non-profit, The Freeroofers Society, that can also be found on Facebook. Its goal is to help seniors on fixed incomes who can’t afford a new roof or can’t handle the task of fixing it themselves. He got the idea when he fixed his parents’ roof and heard of others who didn’t have the luxury of a roofer for a son. So he plans to build the roofs free of charge. And he’ll pass on what he knows to those who are willing, but untrained. “It’s also to help people who want to, but don’t know how to roof. So I can come out and show them,” he says. He’s set to start his own roofing company. It’ll allow him the freedom to do more for others. Randall’s goal is for the society to put up 20 roofs a year. He hopes there will be others to help him run it and that other businesses will want to take part. But it also marks a personal point of return. Randall talks of roofs as a means to an end. 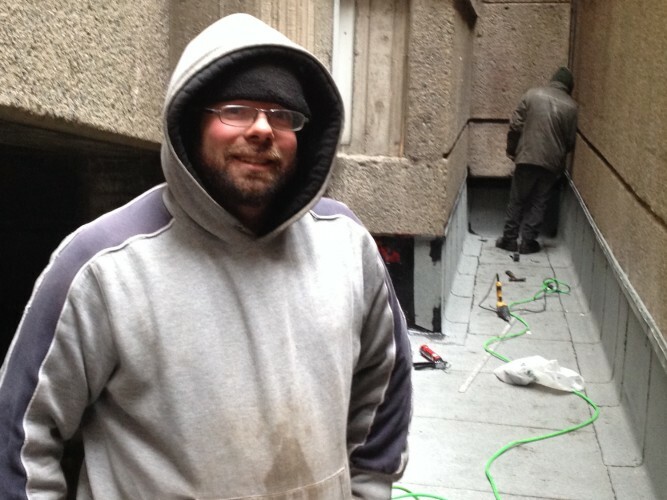 Roofing started as a job he didn’t quit, but later became a livelihood. Now it’s a lifestyle. His favorite part? U rock Adam! I hope all goes well! U are an inspiration. Proud of you brother. It was nice to come across this story! Awsome Adam I once two drank very heavily and was losing everything then I met a wonderful girl online plenty of fish to be exact whom later became my wife I moved from my home town to where I am now worked under a contractor here for a year but been doing carpentery for More then 15 years I was still drinking but not as much then I decide I should be on my own.